Napoleon As you were. Begone, peasants! As for you, take that bib off - we don't eat for an hour yet. Josephine Napoleon, did you hurt yourself? You told me you would be in Egypt tonight. Napoleon That remains to be seen, but where are my faithful advisers, Fran�ois, Alphonse and Gaston? Josephine Do you wish their advice? Chico passes Groucho with outstretched arms to the Empress. 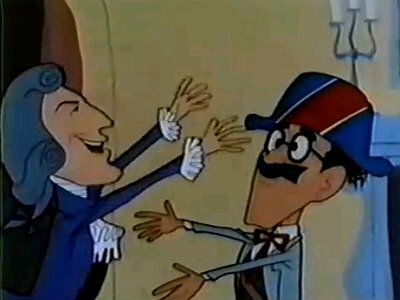 Zeppo passes Groucho with outstretched arms to the Empress. Napoleon This devotion to me is touching, but it's not touching me. Harpo whistles and heads straight for the Empress. Napoleon Well, they are all taking the detour. There is a lot of heavy lipping going on around here, but somehow or other I got shoved out of it. But then I must not tarry. I must be off. Josephine, if I leave you here with these three snakes, I must be off. Josephine Napoleon, when you go, all France is with you. Napoleon Yes, and the last time I came home all France was with you...and a slice of Italy too. Alphonse Haahaa, he means me. Napoleon Yes, it's you I mean. And I could've left the "s" off "slice." Josephine Napoleon, fight as you never fought before. Napoleon Farewell, my Queen. Vive la France! Josephine I thought you were never coming. Alphonse I thought-eh Napoleon was never going. A knock is heard offstage. Josephine Alphons, hide! Someone's coming. Josephine Oh! It's you. I thought you were at the front. Napoleon I was, but nobody answered the bell, so I came around here. Josephine Well, what are you looking for? Napoleon My sword. I lost my sword. Josephine There it is, dear, just where you left it. Napoleon Farewell, my Queen. Vive la France. Alphonse Josie, has he gone? Alphonse Anybody. Ah! Josie, you are so beautiful. Josephine giggles. Why don't you marry me? Alphonse Awright, I gonna marry him too. He's got money. He's the guy I'm really after. Alphonse And it's-a bigamy too. Josephine Please play. I love music. Alphonse Awright! Chico plays the piano. There's a knock on the door, Groucho enters, Chico dives under the piano and crawls off. Josephine You're here AGAIN?!?! Oh, Napoleon, you're HERE again? Napoleon I lost my sword. Napoleon I had a swell chance to stab one of those Russians. I was gonna stab him right near the gates of Moscow. If I find my sword, I Moscow and get him. He promised to wait, but you can't depend on those Russians. Where's my sword? Ah! There's my sword. Farewell, my Queen. Groucho exits and Harpo enters carrying a harp over his shoulder. Josephine Gaston! I thought you were never coming back. Won't you please play for me? 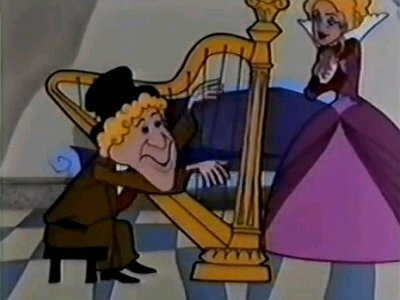 Harpo plays the harp. A knock is heard and Groucho enters. Harpo hides under Josephine's crinoline and honks twice. Napoleon Woman! Who's been here? Harpo honks his horn and crawls off. Napoleon Remember, you can fool some of the people all of the time, and you can fool some of the people all of the time but you can't fool some of the people all of the time! I just made that up. Lincoln stole it from me. Someone's been here. Ah! He's a harp. Napoleon Do you think you can stand there and make a schlemiel out of Napoleon? Do you think it's fun being Napoleon? How would you like to be Napoleon and stand like this for a hundred and fifty years? Someone has been here. I'm going to investigate. I'll smoke out these Siberian jackrabbits. Groucho brings a flit gun out of his jacket and starts to pump. Josephine I love but you. Napoleon Come out, come out, wherever you are. Napoleon Officer of the guard, remove the swine. Two soldiers are pulling Groucho. Hey! You've got the wrong swine. Harpo whistles, standing with a lampshade over his head. Take that off. I know you. Harpo whistles and runs away, colliding with Chico and Zeppo. Company fall in, right about face, forward march! Josephine Napoleon, what are you going to do to them? Napoleon Look at them down there in the courtyard. The firing squad will soon give you my answer. Groucho does a horse laugh. A first shot is heard offstage. A second shot is heard offstage. A third shot is heard offstage. In retrospect it's a pity that Zeppo didn't do his own voice since he was still around in 1970. I don't know if was asked to do it or not. Another note of interest is that in this version, Zeppo and Chico has switched parts so that Zeppo plays Francois and Chico plays Alphonse. 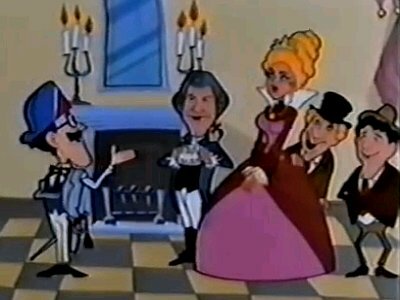 Romeo Muller is credited as having written "special material" for the show, but the script for the Napoleon scene was probably supplied by Groucho. 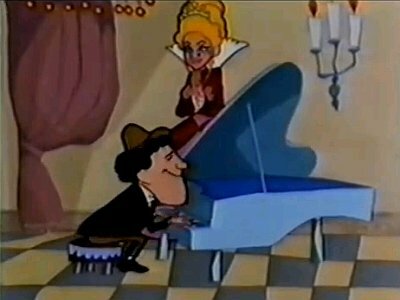 Although not remembered by the general public, Mad Mad Mad Comedians at the time gave producers Rankin/Bass their highest ratings ever. This version of the "Napoleon Scene" is available in Real Audio on Frank Bland's "Why A Duck"-site, in the Streaming Audio Files section.